Eurodollar rebounded from local correctional level of 50% once again, which is strong signal for new descending movement. I’m still keeping my sell order with target in lower area, where there are several fibo-levels. As we can see at H1 chart, pair rebounded from level of 50% right inside one of temporary fibo-zones. Local correction has passed level of 78.6%. Possibly, pair may break local minimum during the next several days. Franc did reach level of 50% and rebounded from it. In the future, I’m planning to open buy orders during local correction. Target is in upper area, where we can see several fibo-levels. 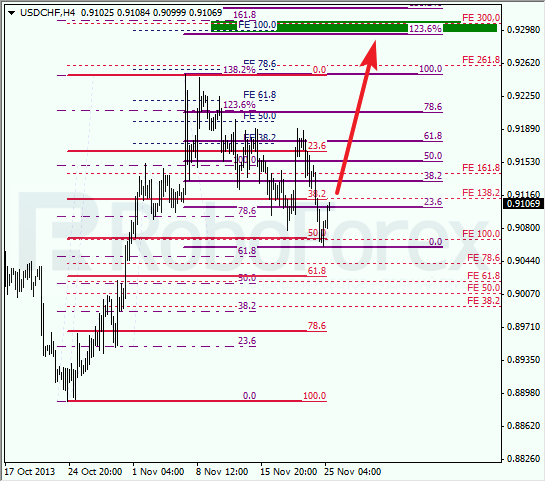 At H1 chart, we can see that pair rebounded from two levels, 50% and 78.6%, inside temporary fibo-zone. Later, price is expected to break local maximum, approximately this Wednesday.